Good morning everyone! If you read my post from black Friday, I was trying to determine that Cyber Monday is a scam, and the best prices online can be found on black Friday. Turns out that I was half right. The more expensive gifts were the same price, but the cheaper items were more. Cd's from Amazon.com: Increased by double! Kelly Clarkson and Pink were only $5 on black Friday! Taylor Swift is only .10 cents more. 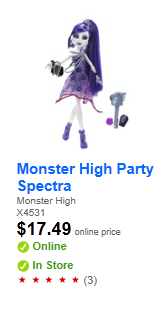 This monster doll is the same price. And why are kids so into monsters these days?? This was $39.99 on Friday. In conclusion, it is best to take care of your internet shopping on black Friday as opposed to Cyber Monday in many cases. Best case scenario is that they are the same price. It won't bankrupt you to wait til Monday or anything, but as the old adage goes: Watch the pennies and the pounds(dollars) take care of themselves! I'll definitely have to remember this for next year!